Fibre Channel over Ethernet (FCoE) is a protocol for transmission of Fibre Channel in full duplex Ethernet based networks. The main objective of introducing Fibre Channel over Ethernet (FCoE) is I/O consolidation on the basis of Ethernet (IEEE 802.3) with respect to the reduction of physical complexity of network structures especially in the data centers. Previously we discussed about Fibre Channel and this article is fully dedicated for Fibre Channel over Ethernet (FCoE). This is the elaboration of the previously published article. With Fibre Channel over Ethernet (FCoE), it is possible to use a single physical infrastructure for the transmission of Fibre Channel and conventional Ethernet. 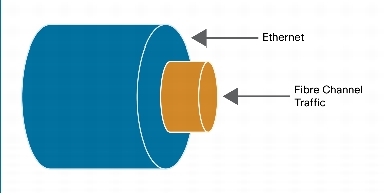 Thereby it provides the scalability and higher bandwidth of Ethernet-based network structures with currently common 10 Gbps connection, it represent significant advantages through the use of Ethernet for transporting Fibre Channel frame and limiting the other drawbacks of the classical Ethernet protocol, such as the frame loss in overload situations; for supporting a number of improvements to the Ethernet standard, it is needed to ensure reliable transmission based on Ethernet. The standardization of Fibre Channel over Ethernet (FCoE) began in April 2007, on the 4th June 2009 the draft was published. The main advantages is significantly lower cabling and lower overall cost due to a common infrastructure, as well as representing the better resource utilization of physical infrastructure. Reduction in Cost of operation (energy supply and heat dissipation). Fibre Channel over Ethernet (FCoE) is a routable protocol and can therefore in principle be found beyond the boundaries of a data center. FCoE however is dispensed with the use of network and transport layer protocols such as IP and TCP and is equal on Ethernet. Fibre Channel over Ethernet (FCoE) benefiting from the much lower packet overhead and the associated increase in transport capacity and takes the local limit of Layer 2 domains into account. Moreover, there are special challenges to the commonly used Ethernet standard, which is supported by Data Center Bridging. To deploy this, it requires a data center network infrastructure, which makes the migration generally difficult. Fibre Channel over Ethernet (FCoE) encapsulates the Fibre Channel natively in Ethernet frames which replace the FCoE protocol specification in the layers FC-0 and FC-1 of the Fibre Channel stack. Thus, it is possible to integrate without much change in existing storage area networks into a new Ethernet infrastructure. Because FCoE builds directly on the Ethernet protocol stack, it is significantly different than iSCSI, SCSI block that also transmits data over network protocols, but it is based on the TCP stack. Both Fibre Channel and traditional networks have their own stacks, each providing a set of functionalities. A typical FC frame has a data length of up to 2112 bytes plus header and CRC. The maximum size of an FCoE frame is 2180 bytes. The first 48 bits of the frame to specify the destination MAC address. Another important component of the Fibre Channel over Ethernet (FCoE) standard is the FCoE Initialization Protocol (FIP). This Article Has Been Shared 3053 Times! Cite this article as: Abhishek Ghosh, "Fibre Channel over Ethernet (FCoE) : Detail Article," in The Customize Windows, November 25, 2012, April 20, 2019, https://thecustomizewindows.com/2012/11/fibre-channel-over-ethernet-fcoe-detail-article/.